I forget when it was that I last wrote to you but it must have been long ago as I have written no letters for ages. I have been in hospital now for over a month with malaria, and some complication called “phlebitis” due to a clot of blood in the leg. I don’t know when I shall manage to get about again and I am afraid it will be some time before I can rejoin the Regiment. We left Mbuyani on the 18th May forming part of the 1st East African Brigade under Shepherd and took part in everything that happened during the advance down the Usambara Railway, then across to Handeni, and the final advance on Morogoro. We had a lot of hard marching, short rations, and bad water and I can never say enough about the men. Fighting was never very severe and was usually a desperate effort to cut off the enemy’s rearguards as they never attempted to really stand up to us. The first scrap was at Mkomazi where the Rhodesians did all the fighting there was – we had nothing to do but had our own first taste of artillery, the enemy using a 4.1” naval gun and some field guns. The next bump was at Mkalamo where we tried to round up the garrison who had retreated from Mombo. The fight took place in the afternoon after an 18 mile march, and in attempting to get round the flank and cut off their retreat the Brigade succeeded in getting hopelessly entangled in dense bush. The 130th Baluchis had all the fighting and most of the casualties; we ourselves had only 1 Coy engaged who lost about 3 men. The total casualties were about 60 and prisoners reported the enemy loss as 135. The enemy made good their escape during the night and next day we followed up, and the pursuit continued for a fortnight. We nearly succeeded in cutting off part of the garrison of Handeni and two of their Coy’s were badly knocked about and dispersed by a contingent of S. Africans who formed the reserve of our force. Two days later these same S. Africans followed up the enemy and walked straight into an ambush and the Huns more than got their own back. The next stand was made at the crossing of the Lukigura River where the enemy’s rearguard was located in a strong position covering the bridge. Shepherd Column did a frontal demonstration to occupy attention while the rest of the force did a night march round the back of the position. We were detached from the Brigade and detailed as advance guard in this flanking attack. I think we marched a good 35 miles and fetched up at noon next day plum in the rear of the enemy’s position without a soul knowing of our arrival. Unfortunately the staff had very poor information and no one knew exactly where the enemy were nor the lie of the ground – otherwise we could have blasted the whole b….. However we knocked spots off the swine and finished off with the bayonet, capturing two maxims, a pom pom, lots of ammunition and baggage. With any luck we should have got their artillery and trebled their casualties. We did practically all the fighting that day and Hoskins the Divisional Commander was awfully pleased with the Regiment. At the critical moment just before the final charge we got hung up and I could not get the men on – there were only 2 weak Coy’s with me and we were being pasted by 2 maxims and at least 100 rifles at a range of not more than 100 yds, and the air was fairly buzzing with bullets. Luckily we had about 100 men of the Royal Fusiliers supporting us and they came up and started the charge – once started, our lot went in great style, but it was the tommies who got us going. Amongst the stuff we collected was the office box of the 1st Field Coy and in it I found an official account of the part played by that Coy in the capture of Jasin. A few days later we continued the pursuit as far as Makindu on the Misha River and there we had to halt as the line of communications had become so stretched out that the ration difficulty was becoming very serious. Also there were scattered parties of the enemy wandering about behind us threatening our communications. We spent the whole of July at Maikindu and had a very rotten time. The enemy had a strong position about 6 miles away and they brought up a couple of 4” naval guns and dropped their blasted HE shells all over the camp. Their shooting became almost perfect but the damage done was very slight – in fact out of about 600 shells which they put into the camp only 3 really did much harm. Occasionally people got knocked out with odd splinters but on the whole the damage was more moral than material – what made it so annoying was that we had nothing big enough to hit back with. The only officer in the whole force to be touched was Walshaw, one of our attaches, who got a chunk through his right shoulder blade and will be hors de combat for some months. Early in August the advance recommenced, but Smuts’ effort to round up the main enemy forces at Turiani, in front of Makindu, failed to come off and the wily Hun slipped away. There was a stiff fight with a strong rearguard on the Wami River and they escaped again, but I missed that as I had collapsed and was on my way back to base. I don’t know where the regiment has got to but presumably they entered Morogoro with Shepherd. I don’t know how long this show is going on for – the enemy have any amount of ammunition as unfortunately a small ship ran the blockade last April and landed some howitzers, maxims, and tons of rifle ammunition. Apparently they have got clean away south of the central railway and it may take months to round them up. I have seen nothing of the Jinds, but I heard that they distinguished themselves in a scrap near Koragwe, and I rather fancy that they were with the force that occupied Dar-es-salam. 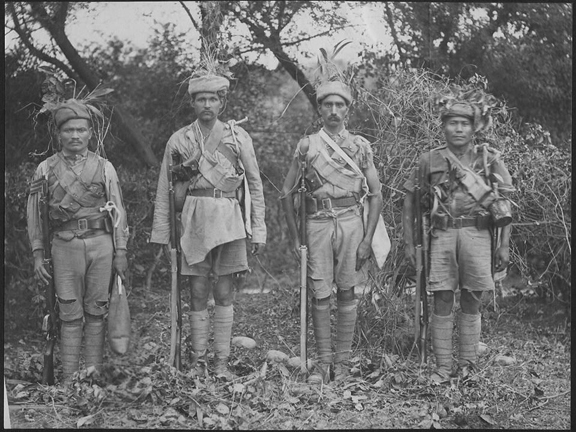 Some of our people have been invalided back to India – among them are 2 N.O.’s (Native Officers) – Subaders Chabilal and Hakam. A year ago Chabilal was probably the best N.O. in the Regiment but he is an old man and hard work, bad food, and fever have knocked all the stuffing out of him – I believe he has served his time for a full pension and he has thoroughly deserved it. If he had stayed on out here he would have died in a month or so, Lyall took the first opportunity to get him back to India alive. The same applies to Hakam who is one of the survivors of the sisal factory at Jasin – the only thing is that he has not yet earned a Subadar’s pension and I think he might be allowed to serve his full time at the depot unless the Durbar can see their way to let him have a special pension. Subadar Lal Singh has also been invalided – he is a useless rotter who has shirked every unpleasant duty and is not worth keeping – a rotten Coy Commander suffering from cold feet. He got a lot of kudos for a patrol affair near Makatau last year but the truth is that two Havildars, Naran Sahai and La Singh, took charge and ran the whole thing. He really should have been tried by Court Martial for the regrettable incident at Laitokitok in March 1916, when he lost 12 men out of his Coy. (Alec has his year wrong this is 1915 and is referred to as Epiron in the Regimental diary and official history – the area of Laiokitok is south west of Epiron, just to the north of Kilimanjaro). I hope you won’t have to send out any more Officers with drafts from India as Kalu Dalbahadur and Amin Khan will make better Coy Commanders than anything you are likely to send from Satwari. Of the last lot of N.O.’s from India Sub Narwal Singh is an old man who would have done better on pension, he is physically incapable of hard work and has been seedy ever since he arrived so he has been left at the depot. Jamadar Shak Wali is a congenital idiot and useless – if we can only get him to do something really bad we might get him pushed out. Jamadar Bal Singh of the 1st KR who arrived last year is turning out well – he is not brainy but is full of guts and in the Lukigura scrap he led his Coy in the charge yelling like a banshee. The whole of that draft of the 1st KI have done well and I always meant to write to Ishar Singh to tell him what a good lot they are – one of them L.NK Guranditta is an exceptionally fine scout who has put in some really top hole work. I don’t know that there is much else to write about – at present I am in the Convalescent Home at Kijabe near Nairobi. My groggy leg seems to be getting on all right and now the other leg has gone wrong and I am practically crippled. The fact is I am bung full of malaria and have had 15 attacks in 8 months and there is some talk of me being invalided to England before it turns into blackwater fever.